On her way to the Paris train station, Madeline spots a thief making off with a magic lamp. Instead of going to summer camp, Madeline and her trusty dog, Genevieve, go in search of the lamp. 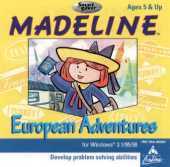 Your adventure with Madeline and Genevieve will take you through four exotic countries, where you'll meet interesting people, solve puzzles, play games and have lots of fun! Skills learned include: Phonics, Spelling, Vocabulary, Parts of Speech, Sentences, and Logic. In the Countries game you need to place the name of each country where it belongs on the map. You can paint lovely scenes from across Europe. Mix paint from your palette to create new colors. Picture Sequencing - the photographer in the Paris Train Station needs you to help him put his photographs in the correct order. Herr Strudel wants you to bring his music box to him. Can you find the right one? In Venice, the drawbridge must be lowered before the train can move on. Can you find a way to do it? Before you can leave Paris, you must get a passport and money to buy a train ticket.